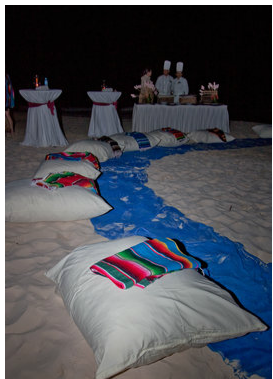 You chose to have a destination wedding!!! Aside from saying “Yes” that was the next great decision you have made Fresa! You chose to be surrounded by your closest friends and family in the most magical place in the world to celebrate your I. Do moment under the Mexican Sun! So, How about giving them all the Welcome they deserve to what will no doubt be the “Event of the year”!!! In most cases there are 2 families to integrate, Aunts that have never left the country, Friends that are meeting for the first time and fathers who have lots to discuss! So, why not throw a party for all of the colors of your families to unite and get to know each other a little better before the big day! We know there are lots of great ways to celebrate a Welcome/Sundowner event, however in another Fresa first we thought we would share a great new option for you all! Who doesn’t love a good old fashioned BBQ/Bonfire? All of your people huddled around the open fire with all of the trimmings. Toasting Marshmallows, making Smores, Roasting wieners and good Cold Beer. What’s not to love? 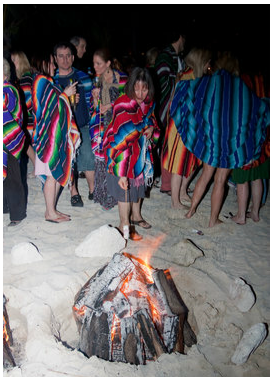 Well, How about having that same tradition you love with a Mexican twist? 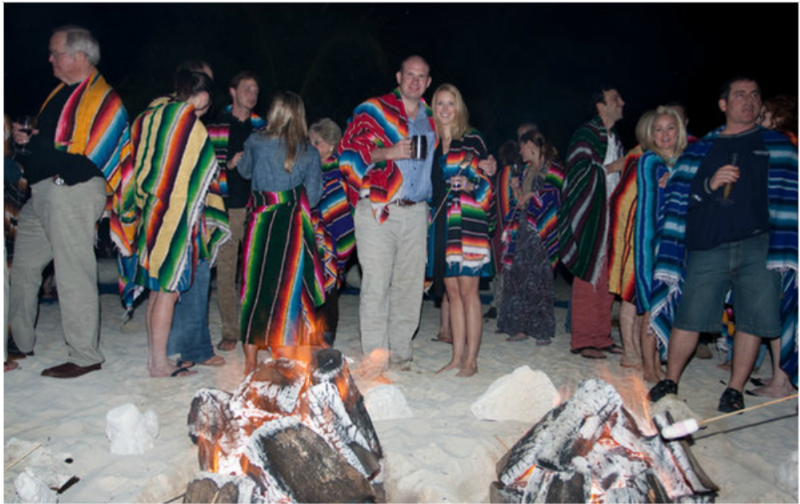 We were lucky enough to host our very first Beach BBQ/Bonfire welcome party for Julie and James not too long ago and as it was such a hit with everyone in attendance we thought we must share with all of your beautiful brides to be out there! 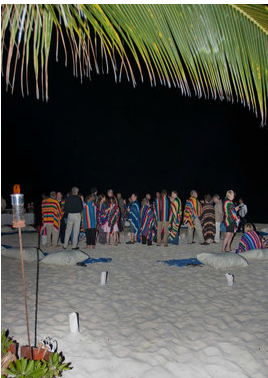 We started the event with a traditional yet very casual BBQ dinner. It was very important to Julie to have her guests feel as comfortable as possible so she even added to the itinerary card in the welcome bags “Come as you are, bathing suits approved, Showers optional”! The décor kept things as fun and welcoming as the Mariachi Band as we used Picnic table inspired red gingham table coverings and offered a “sit where your confortable” atmosphere. We served up Cheeseburgers with sides of plain lays potato chips and a delectable macaroni salad! After a long day of travel, this soul food was a huge hit! It was a wonderful celebration and what made it such a hit was the overall feel of the event! People were in comfortable clothes, eating comfort food and surrounded by new and old faces that they were able to easily get to know as the environment created such a welcoming and non-threatening feel. The fireside stories that were shared that night made it an evening that these guests will never forget and also made all of the other days leading up to the wedding that much more fun and memory filled! What a fun idea!! Looks like everyone had a blast! Love it! As usual you come up with some awesme tricks Fresa!! Can you do this at any resort? Hola Hola Qupid! I think that it all depends on the property, you will need to check with your WC! We actually hold these events off site at a more private location! We arrange the transportation and entire event for you! Let us know if you would like more information! We would be HAPPY to help! Add us to the list of those who LOVE this idea! Would be so fun to capture such a fun, creative event!